Seven million Americans are stuck in part-time jobs. They are unable to get full-time work and the benefits and stability that come with it. It's a constant struggle for these families and a worrying sign for America's recovery. Overall U.S. unemployment has fallen steeply in the past year (from 7.2% in October 2013 to 5.8% in October 2014), but too many people can only find part-time positions. The number of people working part-time involuntarily is more than 50% higher than when the recession began. There was a similar spike in part-time workers in prior recessions, but it dropped quickly. That's not happening this time around. In fact, some states have seen an increase during the recovery in people languishing in part-time jobs who want something more. Dead-end jobs: Paige Stevenson is caught in the part-time job trap. She started working six months ago as a legal assistant for 30 hours a week in Annapolis, Maryland, a state where involuntary part-time has doubled since the recession began. She keeps trying to find something full-time. Stevenson accepted her current position as a "stop-gap" measure because she had been unemployed for a while and wanted to get back into the workforce any way she could. She earns $15 an hour and receives no benefits, but her husband's technician job provides health care for the family. After taking into account daycare for her 4-year old son, a home mortgage and the cost of living near Washington D.C., she is in debt. "When you're dealing with part-time jobs, they're basically dead ends," Stevenson, 32, says, "Employers, at least around here, have been asking for the moon and paying zero." Her story isn't unique. People in part-time jobs are five times more likely than full-time workers to live in poverty. About 75% of part-time workers either live in poverty or are low income, according to a report by Rebecca Glauber, a professor at the University of New Hampshire. There is also a strong connection between unemployment and part-time work. Often these jobs don't last long. "They're extremely economically vulnerable," says Glauber. "There's a real worry about those who are employed in relatively low quality, part-time positions." 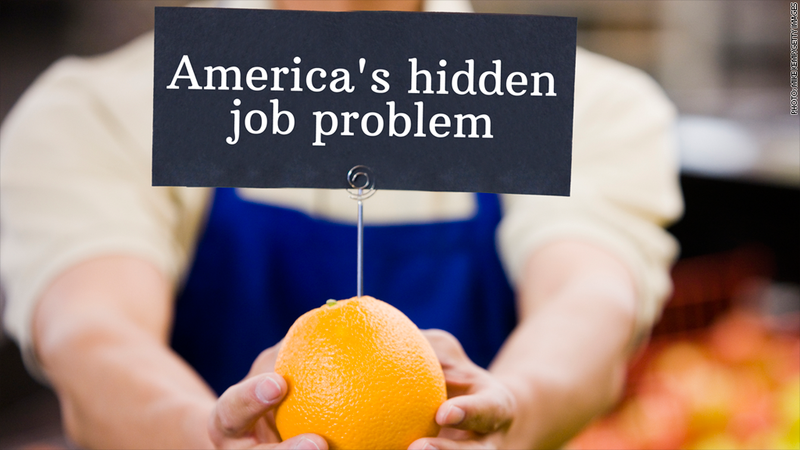 Hidden Unemployment: Like Stevenson, many part-timers go through periods without a job. Almost 30% of involuntary part-time workers are unemployed for three months or longer in a year, according to Glauber. While these people are often glad to have a job, the reality is that involuntary part-time is "hidden unemployment," says Chris Tilly, a professor at UCLA. For instance, if a person works 20 hours a week, but wants 40 hours, that unfulfilled time is spent unemployed. "It is unemployment, but it is hidden unemployment that doesn't get counted by the official figure," Tilly says. Pay is unequal too, he added: "Part timers get a different rate of pay than full-timers for doing the same job." No Benefits: Most part-time workers receive no paid sick leave, vacation days or job training that would improve their careers. Many have no health insurance or pay for it out-of-pocket. The Affordable Care Act, or Obamacare, requires employers to provide health insurance to employees working 30 or more hours a week in 2015. There has been concern that some businesses will scale back worker hours to avoid having to provide insurance. Walmart (WMT), the nation's largest employer, announced in October that it will not provide health care coverage for about 26,000 of its part-time employees, although it did not attribute this move directly to Obamacare. Target (TGT), Home Depot (HD), Walgreens (WAG) and Trader Joe's have made similar announcements. Meghan Brachle can only get 29 hours a week at Whole Foods (WFM), one of her three part-time jobs. Whole Foods offers a health care plan to part-time employees, but Brachle says she would have to pay about $200 a month. With her $11 per hour wage, that would cost her 15% of her monthly pay from Whole Foods, before taxes. Under Obamacare, coverage is considered unaffordable if it's more than 8% of one's annual household income. Brachle's managers at Whole Foods want more availability from her, but won't promise more hours, she says. "If somebody is going to invest their life in a company," even part-time, says Brachle, a 33-year old college graduate, "you still should deserve benefits and know that your employer will take care of you." Whole Foods did not return CNNMoney's request for comment. Some have offered a one-time tax credit to part-time employees to purchase an Obamacare plan, but it's only for a year. The severity of part-time employment, and its impact on families, reflects how weak the economy still is five years after the recession ended. "It's a sign that the labor market isn't healthy enough," says Robert Valletta, an economist at the Federal Reserve Bank of San Francisco. "We still see a lot of involuntary part-time workers."